An increasing number of car owners have come to us for sunroof repair and replacement. What accounts for the increase of shattering sunroofs? The incidences aren’t limited to the Bellingham area. The National Highway Traffic Safety Administration (NHTSA) has also launched an official investigation. The usual suspects contribute to the majority of broken sunroof glass. These include projectiles, ranging from stones to acorns. Such seemingly harmless objects can inflict serious damage at high speeds. However, this still does not account for the sudden spike in shattering sunroofs. So, what’s going on? Some analysts theorize that the cause is due to thinner car frames. More auto manufacturers are using thinner metals or aluminum to bring down costs and vehicle base weight. The thinner frame means less structural support for the sunroof. This makes it more likely for the glass to give way in the event of impact from a projectile. No changes, though, have been made to the glass itself. A cracked sunroof is actually more dangerous than a cracked windshield. The former is usually made from tempered glass, whereas windshields consist of laminated glass. When laminated glass shatters, the pieces remain mostly intact, thus presenting minimal harm. Tempered glass, on the other hand, shatters to tiny pieces and can cause cuts and scrapes to car occupants. When detailing your car, we recommend a visual run-through. Do you notice any pebble-sized cracks? The fracture may seem negligible but further impact can quickly weaken the already-compromised glass. 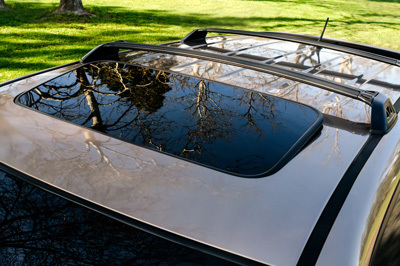 Our auto glass repair department includes sunroof replacement. See our pricing for specific repair and replacement costs. Bring your car on over to Bellingham Detail and Auto Glass if any part of the glass cracks. A shattered sunroof is not only an eyesore but also a safety liability. Posted on April 28, 2018 under in advice | By ignite.